We have an all time favorite dinner: a bowl of boiled potatoes and a bowl of fresh garden salad. No matter what elaborate meals I make, once a week (or more) we need to have our favorite meal. And I have two men to watch me (I've tried to skip it for some time but was firmly reminded to add "our favorite potatoes" to the weekly menu). Our Farmer's Market has a variety of potatoes, hence we have a variety of potato meals. My latest favorite are fingerling potatoes that come in different colors: yellow (Russian Banana), Purple Peruvian, and red (French Fingerlings), to name a few. I started with the yellow: when cooked they hold shape but it's creamy flesh melts in your mouth into the pleasing your taste texture. There is no recipe how to make this potatoes, you just boil it, drain the water and top with a tablespoon of a oil of your choice, salt, minced garlic, chopped dill (mandatory in my family! ), and freshly grind black pepper. 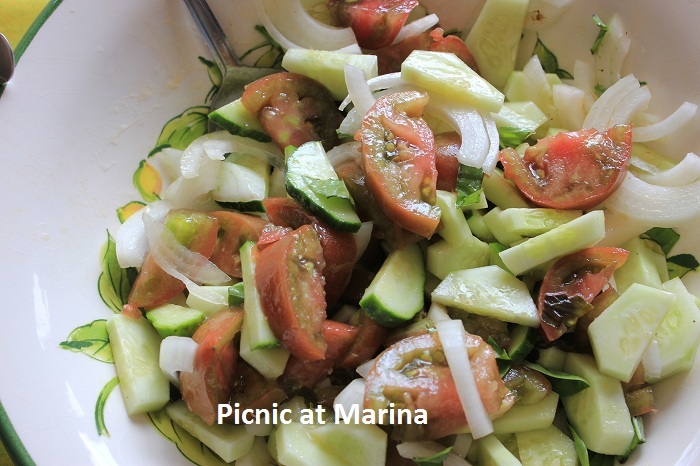 Mix and serve with a side of meat, fish, or in our home with some garden salad. Easy, quick, delicious, and healthy too (potato is a good source of dietary fiber and vitamins and minerals). Out of curiosity I made boiled potatoes for dinner several days in a row, thinking that my men would notice and ask for something else. Silly me! they didn't get bored of potatoes at all, and even when I asked they said they would eat boiled potatoes every day! Message taken. Do you have an easy "go to" meal? I've never seen potatoes that small! They look so delicious though! I love potatoes! Yours look so good! I love, love, love potatoes! A "go to" meal. I like to boil diced zucchini or yellow squash, a diced sweet onion and a pinch of salt until tender, drain, add 4 slices American cheese, some butter and ground black pepper. Pour into a baking dish, sprinkle some Pepperidge Farms cornbread stuffing mix on top, dot with butter, bake 325 degree oven for about 20 minutes and serve with a green salad and a cold slice of melon ... yum. I'm a potato lover! I would love to eat just these for my diner!! Yummy! When I lived in Europe, I didn't see those potatoes. Do they grow it in France? They mast have French Fingerlings? We had baked potatoes for dinner tonight - I hadn't made them in ages and I have to say I really enjoyed them. As for a go to dinner - pasta with pesto - Its one of the few that everyone in the hosue eats without whinging. I can't wait for my potatoes to be ready for harvest. Like you simple treatment, simple is always the best. Hey Marina, everybody loves potatos, those fingerlings are so cute and I really like the purple ones. Everyone who reads this post is going to be making potatoes tonight or tomorrow, you know that right, LOL. I know that I will be. "Boiled potatoes topped with sunflower oil, salt, minced garlic, dill, and black pepper" that's a delicious meal. It looks so yummmi!! I love the tiny potatoes - yum! Actually I love potatoes in general ... my to go meal is usually chocolate - does that count? :) Have a great day! Potatoes are great! We don't eat them that often, but they're always a treat. 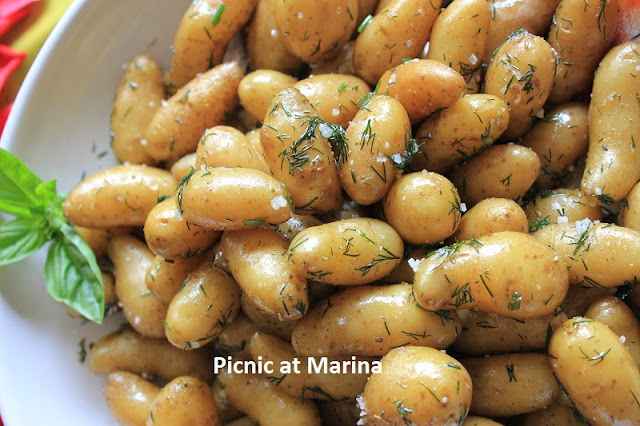 I love the small potatoes - and the ones from a farmer's market are always terrific! Fun post - thanks.